Magnesium and its alloys are characterized by good specific mechanical performances (strength and stiffness), good thermal conductivity, electromagnetic shielding capacity as well as excellent machinability and low density. Consequently, in the last two decades the employment of magnesium and its alloys was extended to the automotive and aeronautical industries for the production of lightweight structural components and in the electronic industry for simple thinwalled castings. For engineering applications, magnesium is usually strengthened by alloying mechanisms; it can be alloyed with other alloying elements such as aluminum, zinc, manganese, zirconium and rare earth. Besides the low density, Mg and Mg-based alloys also have other attractive properties, such as an excellent damping capacity and good electromagnetic shielding. Moreover they have good castability and machinability, and potential for availability because of its wide distribution in the Earth’s crust and sea. The ultimate goal of grain refinement is to obtain a fine, uniform and equiaxed grain structure. Attainment of equiaxed grains can be regarded as the first step towards this goal and further refinement is devoted to reducing the grain size. Up till now, there have been various grain-refining methods developed for Mg-based alloys, mainly applied to the wrought and cast products. 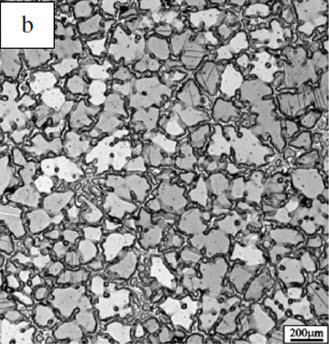 Fine grain microstructure favors uniform deformation and improves isotropic mechanical properties of the materials with a hexagonal close-packed (hcp) structure. It is also well-known that, the microstructure prior to forging or extrusion, i.e. the solidified structures of an ingot, has a significant impact on the subsequent forging properties. There are a variety of different methods to achieve refined equiaxed grains in Mg alloys: rapid cooling, melt super heating, alloying addition of Zr and carbon inoculation. Rapid cooling may not be a viable option for particular castings, and super heating uses extra energy and increases oxidation of the melt. Using the alloying addition of Zr with Mg–Al alloys will poison the alloy due to the formation of stable Al–Zr intermetallics. Carbon inoculation utilizing C2Cl6 can provide significant refinement in Mg–Al alloys; however, toxic chlorine gas is released during the process creating a hazardous work environment. 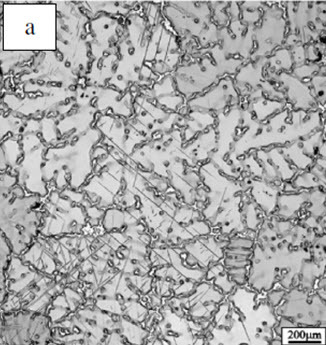 The most commonly accepted theory of carbon inoculation based refinement in Mg–Al alloy systems is that carbon reacts with Al in the melt creating aluminum carbide (Al4C3) particles (stable to 2200°C) which promote grain refinement . It has been hypothesized that carbon reacts with Al to form Al2CO; however it has been found to be thermodynamically improbable to form Al–C–O compounds with extremely low partial pressures of oxygen in the Mg–Al melt. The mechanical methods of grain refinement generally involve the agitation of the melt to break apart developing dendrites. These broken dendrites would spread in the melt to act as additional heterogeneous nucleation sites. Lee et al. determined the process was most effective at high temperatures, around the levels used for superheating grain refinement. These higher temperatures increased the rate of formation of the nucleant phase (likely Al4C3) throughout the melt, promoting grain refinement. Mechanical agitation at superheating temperatures appeared to enable a combination of broken dendrites and Al4C3 particles to act as nucleation sites. Similarly, Liu et al. proposed that vibration caused cavities to form in the melt, which attracted impurity particles and enabled them to become nucleation sites. Some researchers found coarse dendritic Mg grains in untreated melts, but after melt agitation, these coarse grains were modified to a spherical shape. The differences in grain shape with and without mechanical vibration with AZ91D are shown in Figure 1. While mechanical agitation appeared to work well in refining Mg grains, it requires additional equipment and processing, thus increasing the cost of the final product.